Hello creative friends!! I have a rather unusual Power Poppy card to share with you today. One of my nephews is getting married a couple of days after Christmas and their colors are going to be Blue/Silver. I thought, why not combine a Christmas image with a bridal image for the card I want to make for the bride-to-be's shower. So, I started by diecutting a frame and, using my Misti, arranging the holly from the Power Poppy Holly Golightly set, along with the sentiment from the Dream Wedding set. I embossed the holly with Bridal Tinsel (isn't that just the perfect name for a Christmas wedding card?) embossing powder (Ranger), and just added some Dazzling Diamonds glitter to the Black Onyx Versafine stamped sentiment. Everyone knows you need lots of sparkle for a wedding card right? That's it for me y'all!! But there is a lot of Power Poppy inspiration to be had today. 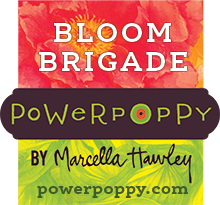 Check out the following Bloom Brigade blogs if you haven't already! Also, we'd love it if you joined in on our Power and Spark Challenge this month. There is a fabulous prize to be won, and all you have to do is use "Portion control". Just use portions of an image on your card. Click HERE for all the details!! Happy Friday!! Shoot...Happy November!! This is my favorite month because this is when we get our Fall colors in Central California, and when the weather finally starts to get cooler!! The 60's are projected for this whole next week, with a few showers thrown in the mix. That is HUGE!! We need rain so badly! 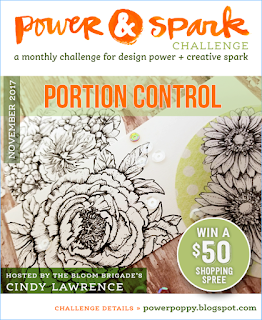 So, since it's a new month, that means it's time for a new Power Poppy Power and Spark challenge and the super talented Cindy has come up with a fun one. We are to practice portion control. That means, use only portions of an image on your project. We'd love to have you join us too. You could win a $50 shopping spree if you do!! Now, how can you pass up that opportunity!! 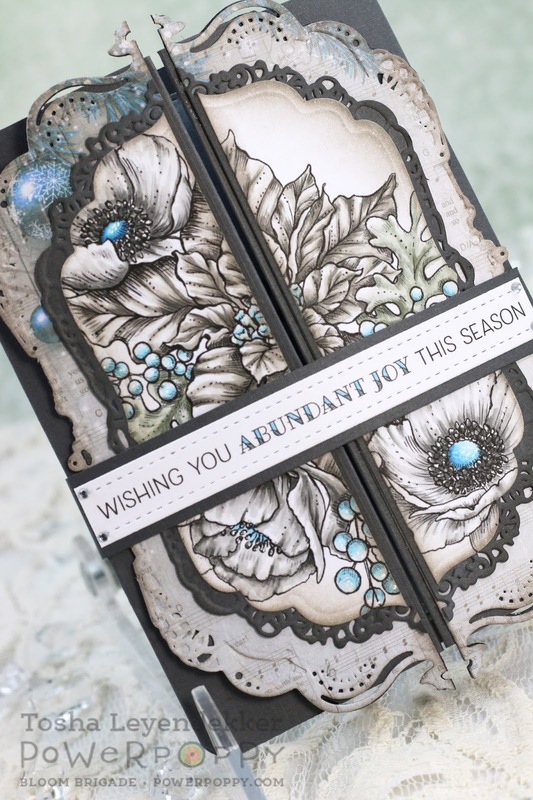 I decided it would be fun to make a Double Gatefold card with a belly band. I haven't done that in many years!!! 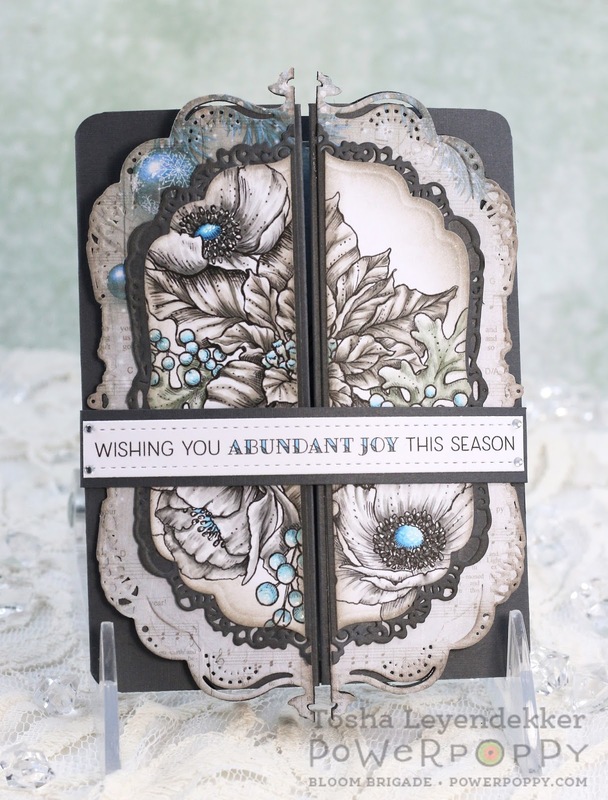 If you'd like a tutorial, a good one can be found HERE on Splitcoaststampers. 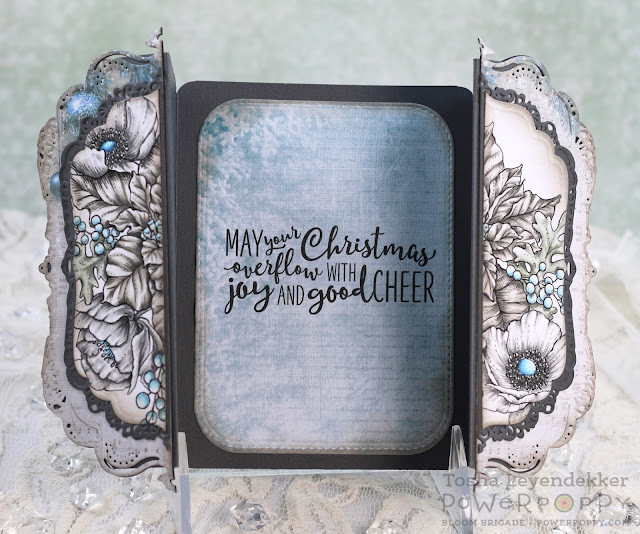 I used the new Winter Wonderland image that I diecut using Gold Labels Four (Spellbinders). I cut it in half, and added it to the front of my double fold along with a belly band to hold it closed. The sentiment on the inside is from the new Flowering Santa set. I love mixing and matching sets. It gives you so many more options. Here's a close up of the closed card and it's belly band. The sentiment is from the new Glitter House Village set. If you haven't seen the new Happiest Holiday 2017 collection yet, be sure to visit the Power Poppy store and check it out. These sets are all quite incredible!! Thanks a bunch for visiting. I hope you have a wonderful weekend!! !